Jets cornerback Darrelle Revis recreated two iconic Joe Namath images for this week's Sports Illustrated—a 1965 cover shot in Times Square and a photo of the quarterback sitting poolside and guaranteeing a win in Super Bowl III. Jets cornerback Darrelle Revis marks his return to New York on this week's Sports Illustrated cover, recreating an iconic image of Hall of Fame quarterback Joe Namath that appeared on the cover 50 years ago. This week's cover was shot in Times Square, the site of Broadway Joe's "Football Goes Show Biz" cover in July 1965. Revis also recreated another famous image of Namath—with the former Jets quarterback's help. The duo traveled to Miami to remake the classic 1969 photograph of Namath, sitting poolside and guaranteeing the Jets would win Super Bowl III. 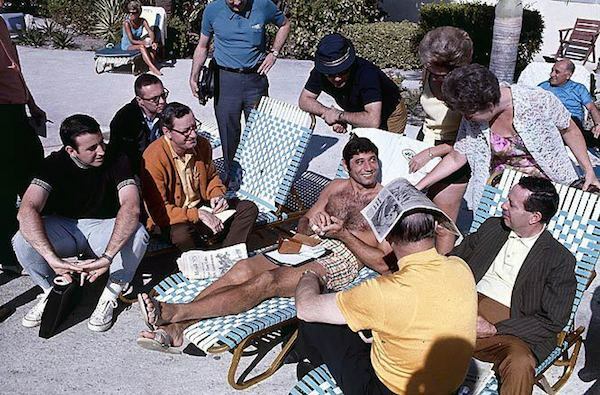 Lounging in a bathing suit with an iPad in tow, Revis was a natural being photographed with an entourage surrounding him and mirroring the moment of Namath’s 1965 guarantee.